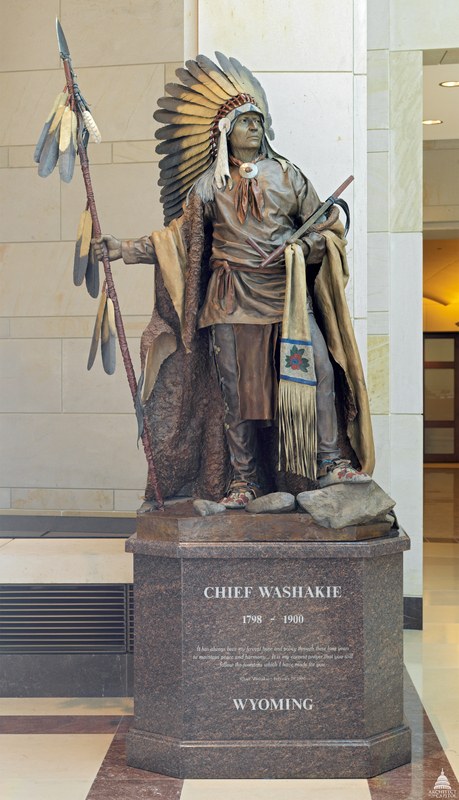 This statue of Washakie was given to the National Statuary Hall Collection by Wyoming in 2000. Washakie's prowess in battle, his efforts for peace and his commitment to his people's welfare made him one of the most respected leaders in Native American history. Originally named Pinaquana, Washakie was born around 1800 in his father's Salish (or Flathead) tribe; he was given the name Washakie when he joined his mother's Shoshone tribe. He became a renowned warrior and in approximately 1840 united several Shoshone bands. He had learned French and English from trappers and traders, and he also spoke a number of Native American languages. His friends among white frontiersmen included Kit Carson, Jim Bridger (who became his son-in-law), and John Fremont. Having realized that the expansion of white civilization into the West was inevitable, he negotiated with the army and the Shoshone to ensure the preservation of over three million acres in Wyoming's Wind River country for his people; this valley remains the home of the Shoshone today. He was also determined that Native Americans should be educated, and he gave land to Welsh clergyman John Roberts to establish a boarding school where Shoshone girls learned traditional crafts and language. Upon his death in 1900, he became the only known Native American to be given a full military funeral.